As of March 2019, the number of active Instagram users per month have grown by 25% over the past year, now racking up nearly 1 billion people. According to Omnicore, the total number of active Instagram users amounts to 500 million daily. Statistics don’t lie, we have a wealth of business opportunities in front of us. At the same time, when the new Instagram algorithm hit the street, it has become more difficult to engage the audience and get more exposure. In fact, now the content is shown in the feed in a timely manner with new posts popping up first place. This is how finding the right time to post on Instagram has become a concern for many social media managers. In response to the call, top marketing virtuosi such as Later, Hubspot, Sprout Social, Hootsuite, and many others revealed the best times and days to post on Instagram that will help you rely on hard data rather than opinions. When Should My Brand Post on Instagram? Being Instagram-ish is the art and your art deserves to be seen. Remember the last time you posted something. Was the engagement rate a far cry from what you assumed it would be? If the reality fell short of your expectations, there’s one mantra to learn and improve your future Instagram activities. Recently, Later has analyzed 12 million posts and discovered that the primetime for Instagram likes is between 9:00 AM and 11:00 AM EST. The best time to post on Instagram is when your target audience gets to work. Manage it until people merge their routine work tasks. The trends we’ve noticed based on Later’s research are the following. Prime Instagram posting times that work best for Mondays doesn’t necessarily work for Fridays. Tuesday is for the early birds and night owls. Posts published on Tuesday after lunch tend to be less effective. Wednesdays are the busiest days of the week in terms of work. Content posted early in the morning or later in the evening gets more likes. Thursday is considered as the best day of the week to post on Instagram, according to Sprout Social, with Instagram traffic times during lunch. Friday is not the best day for Instagram posts unless you wake up at 5 o’clock in the morning. It’s generally a bad idea to post on Instagram during the weekend. In turn, through the attempts to find middle ground between the above, Hubspot’s marketing experts generalized the time slot, assuming that the best time for Instagram posts to get consistent engagement rate is between 9:00 AM and 6:00 PM CDT from Tuesday to Friday. It’s no secret that the best times to post on Instagram depend on certain patterns of your followers’ behavior. Various types of niche content, however, also tend to result in different levels of exposure based on the time they get posted. Due to this, marketing researchers started doing deep dives to see what days and times are optimal for engaging followers in content that varies across industries. Unmetric analyzed more than 250,000 posts and the top 20 Instagram accounts in North America from 11 different industries to provide insights for businesses. Inquiring what is the best time to post on Instagram for Travel & Tourism equals asking when people spend most of their time planning their weekends. Not surprisingly, Friday between 9:00 AM and 1:00 PM are prime Instagram hours when people would sneak at work, exploring their traveling opportunities and getting inspired for the next two days. It would be a mistake, though, to post traveling content during the weekend when people are in the middle of their own adventures. Unmetric data suggests that the leading 20 Instagram accounts which specialize in Media and Entertainment had peak hours from 12:00 PM and 2:00 PM on Tuesdays and Thursdays. During lunch, people usually seek for entertainment and try to get inspired for the rest of the day. That’s why taking a break from work they’ll prefer National Geographic to beaches or resorts at the determined time. It’s easy to guess, but still, there are data from Redbull and Coca-Cola that they get the most engagement on Fridays at 12 o’clock. According to Hootsuite, newcomers to this Instagram community should avoid posting outside of mealtimes, because people are likely to engage with food when they are actually chewing something. Based on data from the Instagram company pages of Nike, Victoria’s Secret, Zara, H&M, and other famous retailers, the optimal time to post on Instagram for likes for retailers is lunchtime on Tuesdays, Thursdays, and Fridays. When eating, people usually tend to explore posts that advertise goods on Instagram. In contrast to retail, providers of educational materials show the highest levels of engagement early in the morning. Posting links to their content during weekdays around 9:00 and 10:00 AM, companies like Ogilvy, McKinsey, or Deloitte get more traction and engagement on Instagram than at other timeframes. Top technology companies, such as Apple, Google, Microsoft, and others experience greater engagement from their followers going on air exactly at 2:00 PM either on Monday or Tuesday. The worst day for techies to post something on Instagram, according to Hubspot, is Sunday. The distinction in peak Instagram posting times should also be noted when it comes to specific business models. Either you sell services to customers or businesses, the time will vary. Hubspot researchers admit that the peak time to post on Instagram for businesses that are trying to engage customers is Saturday at 11:00 AM & 1:00 PM CDT. Nevertheless, the most consistent engagement time is every day from 10:00 AM to 3:00 PM. The worst day to post for B2C companies is Monday when people try to concentrate on work. In the guide for B2B companies, Circle S Studio reveals that B2B audiences actively perform in the afternoon and evening hours, with the exception of 5:00-7:00 PM during commuting and dinner hours. Following this trend, Instagram best posting time for firms is around 11:00 AM, 3:00 PM, and after 6:00 PM on Tuesday-Friday, experts admit. Sprout Social points out that the audience of non-profit organizations shows signs of engagement at time slots similar to the overall peak engagement times on Instagram. The best time to publish, according to the experts, falls on Friday at 2:00 PM, while Saturday admittedly has the least amount of engagement for nonprofits. There are also times when your followers show little to no signs of engagement. The majority of people think that the evenings, and also weekends, are prime time to post on Instagram. But from our experience, this assumption is false. Hubspot found that Sunday is the least magnetic day of the week for attracting followers. On Sundays, people prefer to rest from social media or entertain themselves in a different way. Additionally, Expert Voice has also raised a concern that Mondays receive the least Instagram engagement across regardless of post types. Who to believe, then? That sounds like a lot of peak Instagram hours and time slots to remember. Every sensible social media manager, though, realizes that prime Instagram hours differ for brands and their followers. The key aspect to remember in a myriad of suggested times to post on Instagram is the preferences of your target audience. 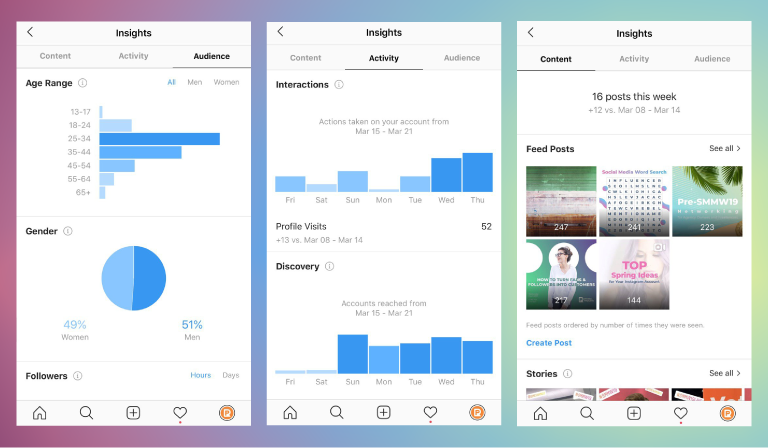 Going to Instagram Analytics in a business account, you can find out the exact criteria that identify your people’s active time online, top locations, and follower days. Instagram keeps you posted on what you need to know when the behavior of your followers is concerned. However, bear in mind that Instagram traffic hours change all the time. Sometimes it’s almost impossible to predict the best time for your next Instagram post without the right set of tools. For your convenience, PromoRepublic has everything you need to perform successfully on social media. From scheduling your social media content across various social networks to suggesting the exact times when it’s best to post, we’ve got you covered. Our social media publishing tool allows to use Time Slots and analyze the best time that drives engagement, based on the type of your business and its particular niche. See us in action. We’ve got so much more to offer if seamless social media experience is your prime interest. What is your best time for posting on Instagram? Let us know in the comments below. A writer by day, a bookaholic by night, and a social media geek by nature, Irene shares only best practices in social media management.